What do you see when you imagine your retirement? 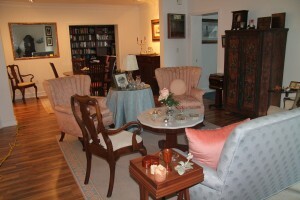 Hosting family and friends for the holidays? Spending time with your grandchildren? Trying out a new hobby, or renewing an old one? Or perhaps relaxing and enjoying some quiet time to yourself? Whatever you envision for your retirement, you can do it in Pennswood’s Angled Two-Bedroom with Den apartment home. 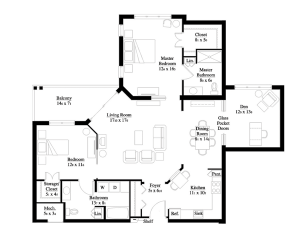 This roomy, 1,470 square foot floor plan features an open layout, a tucked away den, two spacious bedrooms, and a beautiful balcony. with Den will greet you and your guests with a warm welcome. You’ll enter into the foyer, with a spacious coat closet to the left, and the kitchen immediately to your right. With plenty of closet space, you can store much more than just your winter coat. The foyer leads into an open living space that includes the living area, kitchen, and dining area. The space is the perfect place for hosting the whole family.